In 1877, this site, bounded by William and Bannatyne avenues, and Ellen and Gertie streets, was purchased for $5,000 from A. G. B. Bannatyne and Joseph LeConte. 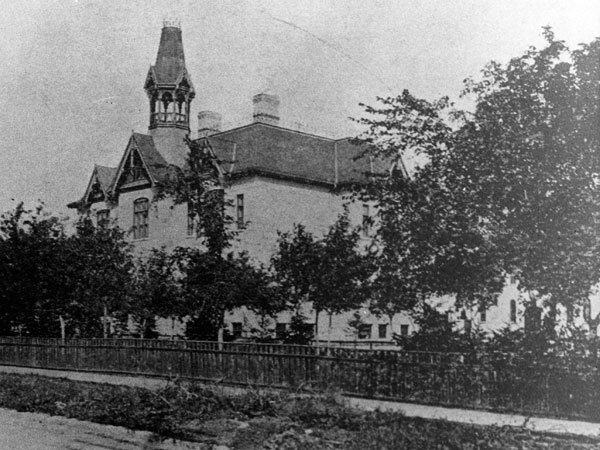 The school built on it was described as “away out on the prairie” because it was thought to be so far from the centre of Winnipeg. 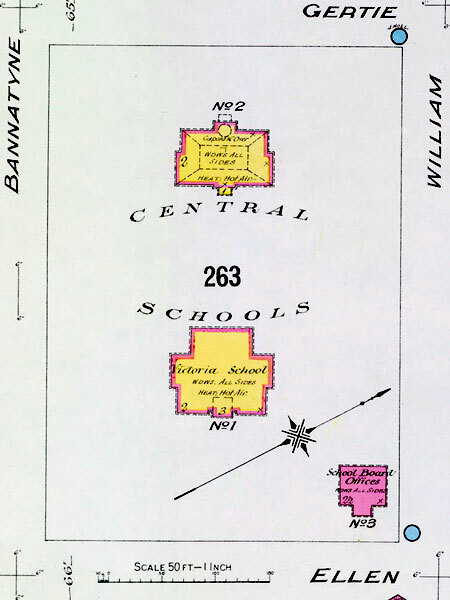 Yet, it became known as Central School, and eventually Central School No. 1 when, five years later, a second school, designed by Winnipeg architect James Chisholm and known as Central School No. 2, was built nearby. 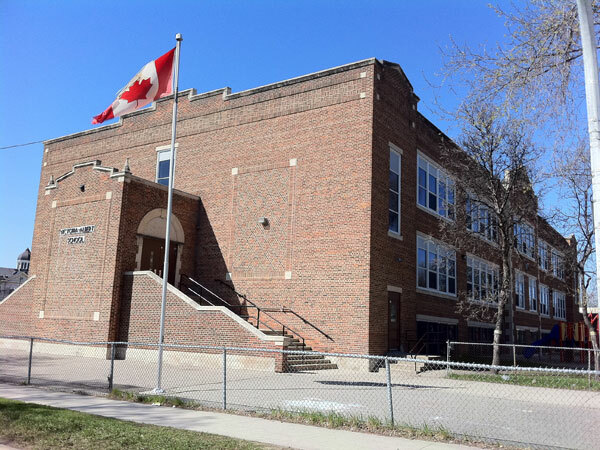 The school names became even more confusing with the construction of South Central School (later known as Carlton Street) and North Central School (later Norquay School) in other parts of the city. 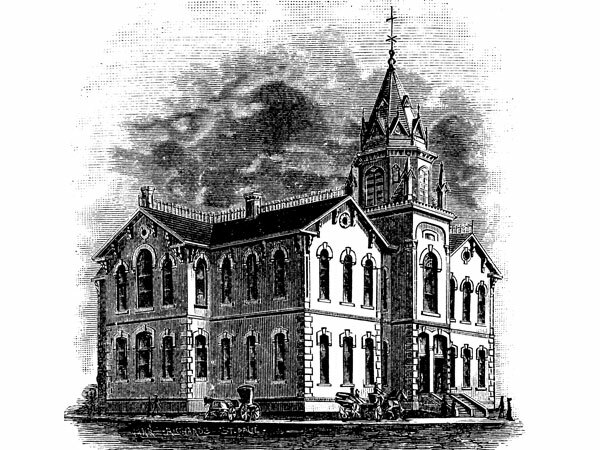 Central School No. 1 was extensively renovated between 1877 and 1898, being first enlarged in 1881, and having a central heating plant installed in 1889 (replacing inadequate stoves that had been installed in each classroom). In 1898, it was replaced by a new structure, built at a cost of $17,000, that could accommodate up to 500 students with a staff of 12 teachers. 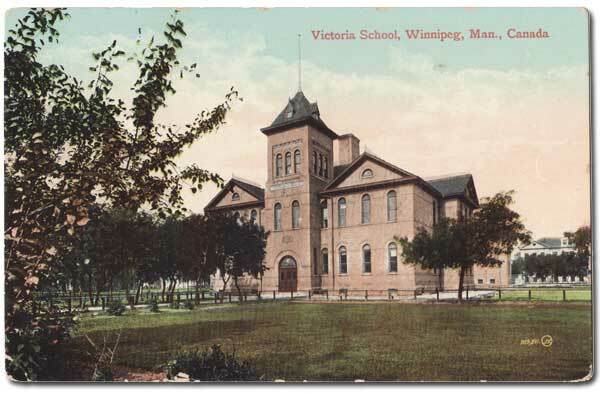 At that time, the school was formally renamed Victoria School, and Central School No. 2 became Albert School, the names commemorating the reigning monarch Queen Victoria and her consort, Prince Albert. 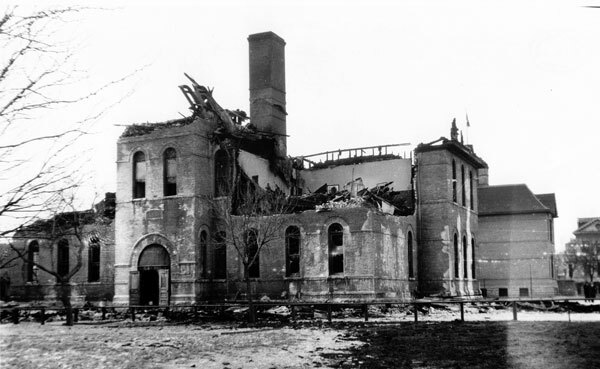 Victoria School was destroyed by fire on 13 March 1930 and, later that year, a new two-storey brick building was constructed on its site, supervised by W. A. Martin. Named Victoria-Albert School, it was designed to accommodate 800 students. When it opened in early November 1930, the old Albert School building stopped being used for classes, and was instead used for repairing desk and storing equipment. It was later demolished. Eunice Aleda Crookshanks, Ada Reive, ? Source: Archives of Manitoba, Winnipeg - Schools - Central #2. Source: Archives of Manitoba, Winnipeg - Schools - Victoria #21. Source: Archives of Manitoba, Winnipeg - Schools - Albert #1. Source: Library and Archives Canada, Winnipeg Fire Insurance Map, 1906, No. 17. Source: Archives of Manitoba, Winnipeg - Schools - Victoria #18, ON247. Winnipeg School Board, Annual Report 1898, Legislative Library of Manitoba. “Opening of city schools,” Winnipeg Daily Tribune, 2 September 1899, page 4. “Assignment of teachers,” Winnipeg Daily Tribune, 1 September 1900, page 1. “Holidays end Tuesday next,” Manitoba Morning Free Press, 31 August 1901, page 10. “The Somerset School,” Manitoba Free Press, 9 January 1902, page 10. “The staff of city teachers,” Manitoba Morning Free Press, 1 September 1902, page 3. “City schools re-open Monday,” Manitoba Free Press, 29 August 1903. “City schools open to-morrow,” Manitoba Morning Free Press, 31 August 1904, page 3. “Assignment of Winnipeg teachers,” Manitoba Free Press, 2 September 1905. “Changes in city schools,” Manitoba Free Press, 31 August 1907. “Re-opening of schools,” Winnipeg Tribune, 29 August 1908, page 1. “Teachers named for all schools,” Winnipeg Tribune, 3 September 1910, page 3. “Assignment of teachers for Winnipeg Schools which open on Sept. 15,” Winnipeg Tribune, 1 September 1911, page 9. “City schools staff assembling in Sept.,” Winnipeg Tribune, 29 August 1912, page 8. “Opening of the Winnipeg public schools has been set for Monday next,” Winnipeg Tribune, 14 August 1913, pages 1 and 2. “Here’s your teacher!” Winnipeg Tribune, 21 August 1914, page 6. “School Board assigns teachers,” Winnipeg Tribune, 20 August 1915, page 9. “Reduce staff of teachers at high schools Monday,” Winnipeg Tribune, 18 August 1916, pages 1 & 12. “Boundaries of schools are named,” Winnipeg Evening Tribune, 24 August 1917, page 9. “Complete plans to open schools Tuesday for 30,000 children,” Winnipeg Evening Tribune, 30 August 1918, page 14. “Teachers are selected for various grades,” Winnipeg Tribune, 29 August 1919, page 3. “Winnipeg schools, No. 1—Victoria,” Manitoba Free Press, 16 October 1922, page 3. “Victoria School is destroyed by fire,” Manitoba Free Press, 14 March 1930, page 1. “New Victoria-Alberta School to open today,” Manitoba Free Press, 3 November 1930, page 12. Three R’s and Three l’s: Immigration, Innovation and Imagination: The Story of Victoria-Albert School by Ron Lyseng. Winnipeg: Victoria-Albert School Committee, [197?]. 60 pp. illus. We thank the Winnipeg School Division and Nathan Kramer for providing additional information used here.